Climate Craziness of the Week – the new climate forcing | Watts Up With That? Taxes are the new climate forcing. I kid you not. It’s sort of ironic. These are the same folks who constantly seed their antideficit speeches with references to our poor, betrayed descendants. (“This is a burden our children and grandchildren will have to bear.”) Don’t you think the children and grandchildren would appreciate being allowed to hang onto the Arctic ice cap? I dunno, my kids haven’t used the Arctic icecap lately, I’m not sure they’d miss it with all the clutter in their rooms. Sorry, the NYT hasn’t been on my reading list for years–a policy that the snippet you’ve shared with us only reinforces. CAGW. How many people are making a good living out of it who couldn’t get a job doing anything else? I read the essay. I also read the comments! Where does the NYT find the idiots to comment? I want to find them and sell them a bridge in Brooklyn. That would be incorrect, but thanks for playing. Even if one accepts the CAGW screed lock stock and barrel, how does a carbon tax or carbon fee stop China or India? Is the West supposed to conquer the world on behalf of the IPCC in order to save it? It isn’t going to happen. Kyoto demonstrated this if nothing else, that nobody is all that interested, and everybody isn’t going to go along with the scheme. Historic trends rather than current expert opinion? Sounds reasonable to me, considering how spectacularly climate predictions have failed to match reality for the last 16 years. The King Canute (Cnut) story is routinely misunderstood and misused by hack media. Cnut was apparently a savvy guy, and anything but arrogant. Gail Collins . . . proving once again that journalists are scientifically illiterate, arithmetically challenged and didn’t study Science in university because it required math. When you have a BA in Journalism and and MA in “Government” you should stick to reprinting Obama’s teleprompter scripts and avoid topics that expose your seriously thin understanding of the topic. As a climate variability reference the AMO’s 11 year moving average is plotted (left hand scale). This appears to support Dr. Svalgaard’s view. Seeing as how the current crop of “experts” have been proven wrong time and time again, using real historic information and data on which to base policies seems like a good idea. As for allowing building on barrier islands, that is okay as long as the taxpayers and insurance rate payers don’t have to bail out the idiots who build there. When those buildings disappear in the surf, they make good fishing structure. It is funny. Gail Collins claims North Carolina is delusional for using actual data instead of unproven and inaccurate models generated by experts who have an agenda. People like Gail Collins takes whatever the team of pro-AGW “experts” has to say as gospel. If the team said that water isn’t wet, people like Gail Collins would believe it and call others who believe differently crazy. Asking the warming camp of climate science about their view of the future is like asking the guy with “The end is near” sign on the street. Both are empircally proven to be significantly much more often wrong than right and could only serve as counter-indicatiors to how reality will actually unfold. Most often the only thing that separates both groups is a federally or NGO funded meal ticket. It is funny. Gail Combs claims North Carolina is delusional for using actual data instead of unproven and inaccurate models generated by experts who have an agenda. People like Gail Combs takes whatever the team of pro-AGW “experts” has to say as gospel. If the team said that water isn’t wet, people like Gail Combs would believe it and call others who believe differently crazy. Methinks you have “the NYT, columnist Gail Collins: ” confused with regular commenter here “Gail Combs” this may prove a little upsetting to the latter. Wasn’t King Canute the guy who sat on the shoreline at low tide and commanded the sea not to rise in order to prove to his courtiers that man (or kings) could not control sea level rises? He probably would be proud of the North Carolina Legislature. Of course the outcome would have been different if he’d had a degree in climatology or journalism. No matter how many independent, refereed papers show that the oceans are not rising in any catastrophic manner: these clowns will just ignore it. Saving our Grandchildren by killing our Grandparents…. Gail Collins has been wrong on virtually every assertion she has ever made. That has never dissuaded her or her employer. She is a propagandist and facts are meaningless to her. She has her convictions and considers herself a member of an elite cadre that was entrusted with ruling the world. How dare North Carolina base it’s policies on actual physical evidence rather than on the Warnings and Commands of the Prophets!!!! I dunno, Tony. Who needs an Arctic icecap anyway (or an Antarctic version, come to that) while we can clutter our lives with stuff? Sen. Whitehouse is a US Senator from RI, a state with the terrible habit of harming itself in every conceivable way. Electing him and anyone else affiliated with the Democrat Party is just one example of our repeated mistakes. We never learn. In fact, we usually double-down on them. Amoebas have more sense about what is beneficial for them, than the citizens of this place. It’s hard to know where to even begin commenting about an opinion piece such as the one written by Gail Collins in the NYT. I guess, for a start, may I make the observation that the opinion she expresses contains no depth whatsoever. In fact it’s positively buoyant with hot air. May I suggest that she dabble briefly in human history and allow herself to discover that our forebears also believed that their actions could cause the anger of the gods with the resultant droughts, plagues, and pestilence that would ensue. May I also be so bold as to suggest she entertain the thought that there is no reason to assume we are not cut from the same cloth as those same forebears. May she also consider that superstition can masquerade as science, that certain disciplines have no choice but to rely almost solely on observations, and that those observations are subject to the prejudices of the observer. May I point out that previous generations forfeited blood and treasure in an attempt to wean us off the primitivism of the past, and that it denigrates their sacrifice not to acknowledge there just might be at least a hint of a resurgence of that primitivism in the supposed ‘new’ theories now presented. Ah, but that would be too much. When I was a kid I used to lie in bed worrying about whether there would be in arctic ice cap remaining when I got old. Today I lie in bed and worry if Obama or anyone in his administration or anyone at the NY Times has any functioning brain cells or understands even a miniscule part of what constitutes genuine science. When it comes to climatescientology we have only imbeciles in the media and government. All this talk about “saving the world for our grandchildren” is a bit hollow, methinks, when you counsider what kind of world will be left to our grandchildren if the alarmies’ agenda is fully carried out. The poorest countries in Africa today offer a glimpse of what kind of woirld it would be. Not to mention grandchildren being sickened and starved TODAY by the lack of cheap energy in their countries. The only other biomass available there is wood – the use of which has inflicted horrific environmental damage. I’ve been to Ghana myself and have seen how most people there, other than the socialist-kleptocrat elite, have to live, and I don’t think any rational person wants that for their grandchildren. With suitable adjustment of the actual tidal data, of course. I fail to see how a tax will result in changes to climate. What it will secure is more widespread poverty, disease, and untimely death. Like other government interventions, when the changed climate fails to materialize, government & their minions & lapdogs will insist it’s the fault of those who found loopholes in the tax, and call for punishments, fines & more regulations to ensure everyone is paying their fair share of carbon tax. What it will never ever achieve is a change in actual climate. The fact that climate change happens on such a slow scale as to be truly imperceptible to the naked body has escaped the warmhysterics, who jump lemming like into the fray parroting the party line that something must be done to fix the “problem” of a warming climate. Would that the climate would bloody warm up already. Sheesh. Met Office: Global warming means that the UK will have climate of the Costa del Sol. Reality: UK’s climate at the moment is the ‘Costa del Svalbard’. “Life finds a way.” Make energy more expensive, and those who can’t afford it will scavenge for less clean energy sources like wood or coal to heat their homes. A carbon tax will do nothing to control climate change. It will only make the masses poorer, their lives harder, and enrich those who control the tax, which is the real reason they want the tax. The state government of North Carolina is overwhelmingly Republican. Clearly Collins is making a political statement by linking the term “denial” to those Republicans. … Methinks you have “the NYT, columnist Gail Collins: ” confused with regular commenter here “Gail Combs” this may prove a little upsetting to the latter. I’m starting to have trouble getting out of bed, some mornings. Please tell me what motivates you, unless, it is only the demons in your head. 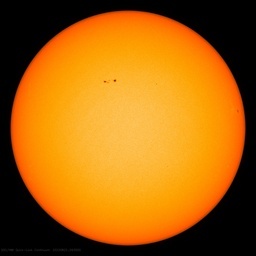 Is the belief in catatrosphic AGW science, ideology, religion, of mere hysteria? How does one go about answering such a convoluted rhetorical question? Can a rhetorical question be satisfactorily answered with another rhetorical question? What would Aristotle believe? Personally, and I say this with all sincerity – as always – I go with hysteria – mass hysteria of the ‘mass’ kind – not Newtonian mass, but rather popular mass, as in mass hysteria. Have I made myself perfectly clear? What I don’t get is what the vast majority of climate warmhysterics think is in it for them. Do they see themselves continuing to enjoy their current lifestyle, barely hampered, with maybe $5 extra on their electricity bill each month? Do they imagine that the fallout from the massive imposition of carbon tax/cap & trade/whatever today’s gov’t intervention is being called, which they are shrieking lies and screaming invective & skewing data in order to achieve in the name of “doing something about climate change,” will not apply to them, will not really affect them, will not really turn them into poverty-stricken hoboes just like the rest of us? Do they imagine that their computers will produce secret slots out of which will pour gold coins to reward them for “fighting climate change?” It’ll be too late by then, of course, but I do wish someone from their side would be willing to field the question. I did. And I’m sorry. The last I checked, the most radical of the estimates for NC sea rise was nowhere near 39″. That 39″ (1 meter) was chosen by the State environmentalists, who wanted to extend their power and control over a bunch of land. The actual rise is even less than the 8″ quoted. It would be *nice* if the nice NYTimes blogger lady got her facts straight, but I realize that “extremism in the pursuit of liberal causes is no vice” in the Times. What sort of delusion leads anyone to think that “carbon taxes” could control climate? These people must be seriously mentally ill. Wanted to write in the comment but of course NYT comments are quickly closed once the communist elite have the proper thought accounted for. However must disagree with say Boston12GS and some others. The NYT has for over 100 years brought to the masses a direct line of information from the most genocidal, racist, socialist filth that have ever walked this planet. Its good to keep tabs on what they are up too and how they view the world… for when the NYT is angry or whining about something you know someone somewhere is doing something good for the world. Plus you always know which republicans are communist because the NYTs likes them(ie mccain). Carbon taxes have certainly forced the political climate in Oz. Labor has fried. I read the Collins piece and it made me want to scream. What kills me is the way she denigrates as deniers anyone who has any doubt whatsoever about the strong program in climate change remediation. Her hubris, as well as her scientific illiteracy, is simply astounding. But that isn’t the bad part, the ad hominems. What’s bad is I read people like her, and the hundreds of smug responders to her twittering, all of them claiming they know with certainty something that is anything but certain, and I realize there is no middle ground. We are talking here about two visions for the future that are diametrically opposed. It’s a zero sum game. One side wins, the other loses. Arrrrgh. A woman whose knowledge of science and technology would make a thimble look like an arena gets to castigate as fools and deniers people who for very scientifically legitimate reasons question her stance on climate change. Even the term makes me cringe. We are in the ME ME ME generation … nothing else matters but MEH! It’s not about “controlling climate change”. It’s about Control. Period. But taking in more taxes would endanger the deficit spending that Krugman sees as necessary – as it would reduce the deficit; a bad thing in Krugman’s view. Note how the Government knows best by removing funds from industry using a tax then return it to industry to counter the effects of the same tax. Our Idiocracy in action which is why we are looking forward to an election on Sep 14. The rather more revealing back story to King Canute (I use the English spelling as he was an english king at the time) was not that he commanded the tide to halt, but that he showed that no matter what his flattering lords told him about how powerful he was – he could not. It is an excellent example of not believing what flatterers say about you. In modern day parlance you could translate this two ways. or one I like better. Canute was the original skeptic. Then Ian W claims that Alex named Gail Combs? Was this cut and pasted, or copied? Then Alex Wade apologises! Has someone been editing these posts? Cue the Globe & Mail in Canada… advocating for Carbon taxes and all those who support the idea. Thanks for the explanation. I didn’t think Mods made corrections/changes without some indication on this blog. Certainly I’ve not seen any evidence of such in the past three and a half years. Vuk – Recall that Knight et al 2005 showed the AMO is oscillatory and at least pseudo-periodic over the timebase of a millenium they looked at (note who the coauthor is – this suggests it is correct, since that guy is no fan of solar influences). I’d say then that both of the good doctors are correct. 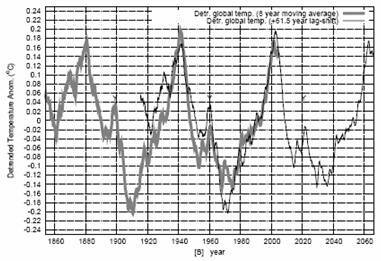 The ~60 year cycle seems also to be a solar indirect effect based on your graph, as is the (previous) solar cycle length correlation with temperature, which is where Svensmark and his colleague Friis-Christensen are coming from. The two influences together on my calcs empirically correspond to about 85% of the temperature rise in the IPCC’s magic century 1906-2005, which coincidentally corresponds to exactly the bottom of the 60 year cycle in 1906 and top of the following cycle in 2005. Funny that. In Australia a carbon tax looks like a swift move to the opposition benches for the ruling coalition of Labor Greens. You could argue that their carbon tax fixed the climate so well it fixed it before even the tax was levied.Now the tax has been so effective it need not be applied anymore because all the good work has been done. America, one good thing is that if Obama gets his Carbon Tax then history tells up that you will not have to worry about a Democrat President for some time…. Latest polling in Oz suggests the Labor vote will land them just 20% representation in the Parliament and perhaps lower, with the rest going conservative (or Katter maybe). Perhaps, the americans reading might just like to quietly point out the Australian Carbon Tax led clean out of progressive parliamentarians to their Dem representatives. Carbon Tax = Electoral oblivion – or maybe just economic oblivion in the case of the EU, fatally wounded by green trash policy. Perhaps the USA likes the fact that it’s heading for debt ridden oblivion, maybe a rescue package, where your federal government will rip 30% direct from YOUR bank accounts? Not so silly after the last week or so UN/EU attack of outright insanity. The oz government, now broke after their green brain snap, is contemplating retrospectively raiding australian’s savings direct from their retirement funds. Let’s rip off the current and future pensioners to get more cash is their motto, after all pensioners have their eyes wide open, and usually vote conservative. Rant complete…. I now return you to your regular programming. Winged monkey, now headed for winged monkey with forked tail status. Why are we letting OT posts like that through? “This means that even though North Carolina scientists predict 39 inches of sea-level rise within the century, North Carolina, by its own law, is only allowed to prepare for 8. I find the 39″ of sea level rise an interesting number since that is the same SLR that FEMA has used to redraw the Flood maps for Flood insurance. And these were drawn before Sandy which had a significant impact since it coincided with a monster lingering NE storm, so it might get worse. Every homeowner on the Jersey Shore (and possibly elsewhere) are impacted by the new, yet to be approved, maps in that some newspapers have reported that Flood insurance could cost up to $30,000 dollars per year. FEMA has increased the risk level from 6′ to 8′ on my lagoon front house that is located several hundred yards off the Barnegat bay, which is in turn extends several miles west of the barrier island that protects us from the Atlantic Ocean. It is true that many homes on the barrier island that were not elevated with piling were damaged. This house has never had water in it even during the Sandy/NE Storm event, yet since my shore home is only 7.5 feet above the reference level, I can expect significant increases in Flood Insurance premiums. Also “they” claim that it can be exposed to mild waves although the waves would have to pass over two streets parallel to the shoreline and 4 Lagoons which seems improbable. I should mention that one cannot get a mortgage without flood insurance in FEMA designated flood zones, which have been expanded via the new flood maps. It appears that the above quoted 39″ SLR this century is now the standard accepted by the government bureaucrats and will be imposed on building standards, insurance premiums, etc. unless someone can stop the exaggerated SLR predictions in the next few months, even though there has been no global warming for circa 15 years. Most of us could live with the North Carolina 8″ SLR. The 39″ edict will drive all but the more wealthy out of homes along the waterfront while also killing property values. One can only hope that blogs such as WUWT can ultimately rescue us from the SLR predictions, cap and trade, carbon tax, ethanol mandates, bans on drilling, and other threats to our lifestyle and economy. Simplest answer to this – don’t have children. And as far as the “one meter rise in sea level” goes, if you really want to have your neighbors pay attention to you, start building a one meter levee around your property. Be sure to tell everyone that you’ve been listening to a prominent NASA scientist, and he makes a compelling case for the deadly rise, and you want to be prepared. North Carolina scientists predict 39 inches of sea-level rise within the century. Based on internal peer reviewed computer models by people who would not get a job in the place if they said otherwise. I think that trusting the integrity of any self selected group in this highly commercially motivated era is sheer folly. Climate scientists are like the tale of the people feeling the elephant and think it a snake based on only the trunk. Others outside the profession see the highly implausible assumptions made in the computer models and the huge errors in the appalling data acquisition now proven to way exceed the current warming level measured. Thanks for the links. You make a good point. Svensmark may well be correct that the cloud formation is significantly modulated by the variability of magnetic fields, but that looks more likely to be the geomagnetic than the heliospheric. I am also sure that the solar magnetic field has strong input in the formation of the the AMO’s 60ish year cycle. re: increases in flood insurance. You may want to check the grandfather clause in FEMA flood insurance. Basically, if your house is in a designated flood zone with a corresponding elevation and your house is built to code and you have had proper flood insurance on the house, you can keep your current flood zone designation even if FEMA redraws the map and increases the base flood elevation. My property was designated as zone D with a base elevation of 13 feet. After Hurricane Andrew FEMA redrew the zone to AE and increased the base flood elevation to 15 feet. Because my property met the conditions of the grandfather clause I was able to keep my insurance premiums at the zone D base elevation 13 feet price. That saves me over $2500 per year! Check it out. At least Providence had the good sense to build a hurricane barrier in the 1960s, unlike New York City, which paid the price for this costly environmentalist-induced mistake when Sandy struck, for which negligence NY wants taxpayers in other states to fork over billions. Its construction began & ended under GOP governors, with a Democrat for two years in between. Thanks for the input, but I believe that the recently passed law is game changer and past grandfathering may go out the window. While I agree that past government policies were insane, insuring high risk locations at low premiums, the redo seems to go the other way by spreading the premium increase risk more broadly into areas that never have experienced flooding by including a 39″ SLR based on computer model projections of global warming. I would appreciate it if you have any further information on the grandfathering you reference. Below is a link provided to me by John Droz as well as a contact at FEMA on the flood maps. This change has impact all over the US mainland, not just the NJ coast. Coming soon, confiscation of a percentage of your bank balance as a climate change fee.